For “Oldies Saturday” we have something extra good: Elvis and the Jordanaires performing “Peace in the Valley”, a 1937 song written by Thomas A. Dorsey for Mahalia Jackson. “Father, the hour has come; glorify your Son that the Son may glorify you, since you have given him authority over all flesh, to give eternal life to all whom you have given him. And this is eternal life, that they know you the only true God, and Jesus Christ whom you have sent. I glorified you on earth, having accomplished the work that you gave me to do. And now, Father, glorify me in your own presence with the glory that I had with you before the world existed. “I have manifested your name to the people whom you gave me out of the world. Yours they were, and you gave them to me, and they have kept your word. Now they know that everything that you have given me is from you. For I have given them the words that you gave me, and they have received them and have come to know in truth that I came from you; and they have believed that you sent me. I am praying for them. I am not praying for the world but for those whom you have given me, for they are yours. All mine are yours, and yours are mine, and I am glorified in them. John 17 consists entirely of Jesus' last prayer, a long prayer he said aloud just before his arrest. It has three parts: First, he prays for himself; second, for his disciples; and third, for the entire world. Today's selection contains the entirety of his prayer for himself, and the beginning of his prayer for his disciples. Although partly it is an actual prayer, in part it is a summation or conclusion of his life and teaching for the benefit of listeners and those who, like us, will read it later. In the first part, he states that his work on earth is finished, and asks the Father to glorify him. In this context, “glorify” signifies that it is time for him to be arrested, killed, resurrected, and ascend to heaven. The following verses are a prayer for his disciples. 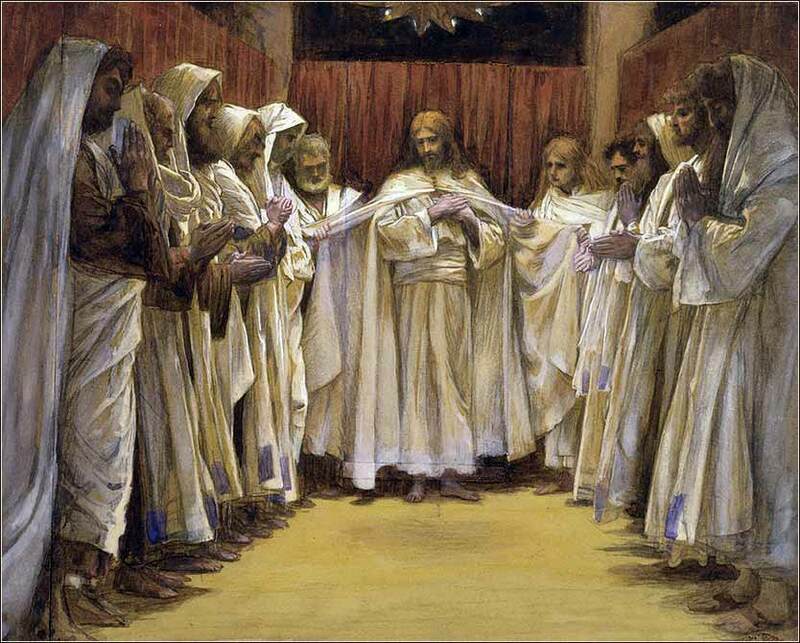 Christ affirms that the disciples now fully believe in him, that what he says is the word of God. He also begins to identify himself as part of the Godhead; for he says that all God has is now his. Finally, he states that glory has come to him through his disciples. This is a bit unusual; all of Christianity is geared to the idea that Jesus' glory came from God the Father, and thus from His own innate divinity. How could the Son of God be glorified in any way by mere mortals? Perhaps this applied only to the apostles; perhaps it applies to all who surpass a certain degree of faith, or perhaps it applies to all those who truly believe in Christ. The word “glorify” is difficult to comprehend fully and seems to have a range of meanings, which also hinders full understanding of this verse. But in the context, the simple and plain reading of “I am glorified in them” means that they add something — although what it is they add to God, who is both perfect and omnipotent, must puzzle anyone who reads it. Hebrews 10:25: We must not forsake our meeting together, as some are in the habit of doing, but encourage one another . . . .